No one ever wants to have to deal with the fallout from an automobile accident, but it does happen in Florida with distressing regularity. Depending on the type of accident, however, the same types of injuries generally occur in each similar crash. It can be helpful to have a general idea of the most common possible maladies you may suffer if you are in an auto accident, as it can help to rule out issues that might otherwise cause time to investigate. The most recent available data from the Florida Dept. of Highway Safety & Motor Vehicles lists approximately 160,000 crashes in 2015 in which injuries were sustained. Out of that number, between 25 and 30 percent were rear-end collisions, many occurring at less than 10 miles per hour. This may sound inconsequential, but even such a low speed is enough to cause significant whiplash injuries, as the neck still moves forward at a different speed from the rest of the body. Whiplash can also cause low back pain, since sometimes the body (not just the neck) will be yanked forward, especially if one is not wearing a seatbelt. While rear-end collisions are prone to cause whiplash, head-on collisions are most likely to cause injuries to the head, face, and brain. Traumatic brain injuries (TBI) are one of the most common injuries sustained in auto accidents, especially among those who forego wearing a seatbelt or wear one improperly. TBIs can range from mild to very severe, and as such, many may not be diagnosed right away. If you or your loved one displays confusion, agitation, an inability to reason, or memory loss after an auto accident – even a relatively minor one – a TBI may be the culprit. While whiplash and brain injuries are more likely to come from forward or rear-end collisions, certain other common injuries may happen with any type of crash. In a T-bone or sideswipe type of crash, the most common injury seen may be simple broken bones. 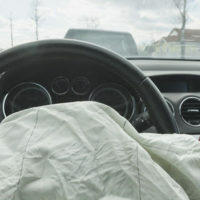 Fractures in the skull, arms, pelvis or chest area are ubiquitous, especially in small cars, where there is less distance between the steering wheel and the driver’s body. Perhaps the most common injury of all those routinely seen in Florida auto accidents is psychological. The American Psychological Association (APA) estimates that up to 45 percent of those injured in auto accidents may wind up being diagnosed with PTSD or PTSS, making it by far the most common cause of PTSD in non-military personnel. Posttraumatic stress syndrome (PTSS) is a cousin of the better-known posttraumatic stress disorder (PTSD), with the only real difference being that PTSS generally has a shorter shelf life. It can cause flashbacks, nightmares, panic attacks and other symptoms that can actively impede living a normal life. Regardless of the nature of your injuries, if you have been harmed due to someone else’s negligence, you may be entitled to compensation. The knowledgeable Orlando car accident attorneys at the Hornsby Law Group will sit down with you and attempt to work out what your next steps should be. Call us today to set up an initial appointment.